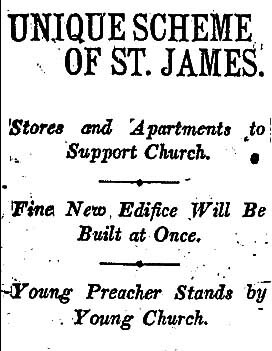 The Methodist Episcopal congregation, formed from a merger of the Centennial and Central churches, planned a wonderful new building at 22nd Street and Union. Although the congregation studied the idea of a new location, the members finally decided there was no better place than the one they had. The church was designed by A. Dudley using an old English half-timbered style with a Gothic tower. The vaulted ceiling was highlighted with gold and the pews were arranged in concentric circles around a corner pulpit.